Fig.1. CAPER-2 rocket heading towards Svalbard. Photo by Lufttransport pilot Eivind Trondsen. The Cusp Alfven and Plasma Electrodynamics Rocket-2 (CAPER-2) was launched from Andøya Space Center (ASC) over Svalbard into perfect optical cusp conditions as seen from KHO on 4th January 2019. The rocket was launched from Andøya at 09:27:00 UT with a flight time of only 8 minutes and 49 seconds to apogee at 774.2 km altitude above Svalbard (09:35:49 UT). Total flight time was 957 seconds or splash down at 09:42:57 UT. The event was captured by pilot Eivind Trondsen on the Lufttransport Dornier 228 flight from Ny-Ålesund to Longyearbyen. The sun illuminated rocket trail is seen towards the south horizon as the rocket penetrates the upper layers of the atmosphere. Fig.2. Google Earth positions of CAPER-2 and Dornier at 09:29:04 UT on 04.01.2019. The image was captured at 09:29.04 UT which is 124 seconds into the launch of the rocket. 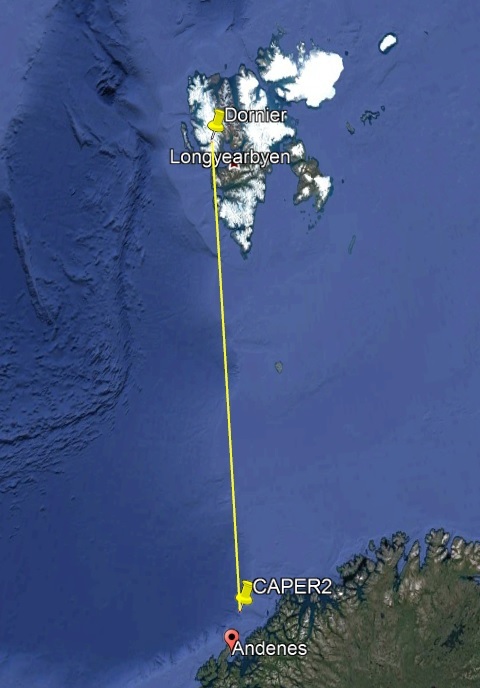 The Dornier was then located at (78.643050°N, 13.500455°E) just North East of St. Jonsfjorden heading towards Longyearbyen. The flight altitude was 7000 feet. The rocket was at this point located at (70.317552°N, 16.261789°E) reaching an altitude of 178.823954 km. As seen from the Dornier the azimuth to the rocket is 173.5861°(SE) and the elevation is 6.3858°. The line of sight distance to the rocket then becomes 961.269 km. The camera is the iPhone 8 back camera. The ISO settings were 2000 with a shutter speed of 1/4 seconds at aperture F/1.8. The focal length is just 3.99 mm. The CMOS image sensor is the Sony Exmor RS IMX315 with 4032x3024 pixels (12.2MP). The pixels are square sized 1.22 um. Figure 3 shows an estimate of the rocket trail size using the camera pinhole model. Fig.3. 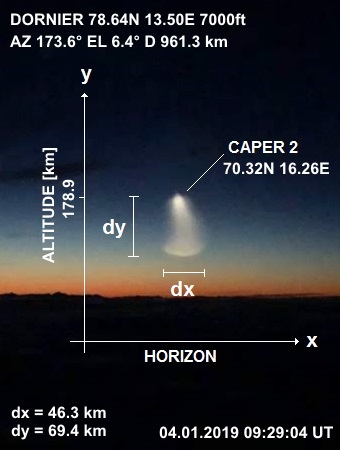 Pinhole size estimates of CAPER-2 trail. The rocket trail extends 46 km horizontally and up to 69 km vertically. The calculation assumes that the image is a full illumination exposure of the CMOS sensor. The trail is most likely the Sun illuminated after burn of the 4th stage of the rocket motor. 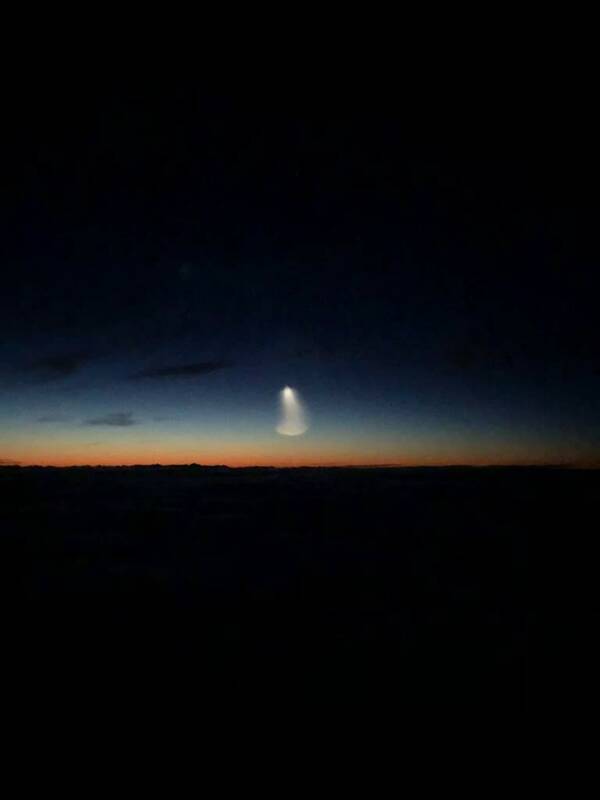 This exceptional image teaches us that we should be able to track rockets early on from Andøya by optical means as long as we operate aircrafts or drones above the cloud layer in Svalbard.